CLEVELAND, Ohio - A Verizon Wireless phone bill triggered so much rage within Robert Able that he ended his relationship with the company in a unique way. He said he became so angry over the bill while talking to a Verizon customer service representative that he grabbed his shotgun and fired a round of birdshot into the phone outside of his home. Able, 72, of Graniteville, S.C., a tiny town in the western part of the state, was hit with $3,357.96 in overages for the month of October. The company said he used 234 gigabytes of data. That averages out to nearly 8 gigabytes per day, which is more than most people use in an entire month. He said he didn't use any of that, as he never goes over his plan of 12 gigabytes a month. He became so concerned that he even filed a report with the Aiken County Sheriff's Department, fearing he had been hacked. Able, a 14-year customer of Verizon, is among thousands of customers from New Hampshire to Arizona who have seen unexplained spikes in their data usage and in their phone bills since last summer. In fact, in September, customer complaints to the Federal Communications Commission jumped to 2,079, according to a Plain Dealer analysis. By comparison, Verizon customers filed an average of 180 complaints in the first eight months of the year. It is unclear what has caused the overages, as some experts have pointed to billing glitches. Others have said new settings on apps for Android phones and iPhones this year caused many phones to use more data. In almost all cases, customers have said that they have done nothing different as far as usage. Many have seen small monthly overages, ranging from $10 to $15. Others have been hit with overages of $1,500 or more. Some are shockingly high, including a Florida mother whom Verizon hit with a $9,100 phone bill. The day after The Plain Dealer reported on her issue, Verizon forgave the bill. Reached about Able's case, a Verizon spokesman Thursday gave the same statement the company has repeated since September, that it has not found any wide-scale problems in dealing with customers' issues. Regardless, Able said he wants nothing to do with the company in the future. Able's issue involves data usage. Data is what cellphones use when not connected to Wi-Fi for everything besides calls and some text messages. If you use Facebook or Twitter and look up information on your phone for about 20 minutes a day, every day while not on Wi-Fi, then you will use about a gigabyte a month. To use 234 gigabytes in a month, which the company said Able did, a person would have to stream videos, use Facebook or Twitter and look up information on a cellphone for 86 hours a day for a month, or watch three hours of YouTube videos every day for a month. Able's story began in September with a trip to California when he and his wife, Francis, celebrated their 50th anniversary. They were gone a month, and he left his wireless jet pack at home. The electronic device provides Internet service to people through a cellular provider, instead of a cable business. The company attributed the data overages to the jet pack, a tiny device that is often a little smaller than a smartphone. A friend stayed at the home while the Ables were gone, and others also went to the house, according to the sheriff's report and interviews. The friend told Able he wasn't sure whether he had used the device. A jet pack requires a password for a person to gain access. While away, Able made a few calls on his cell phone and looked up some directions. 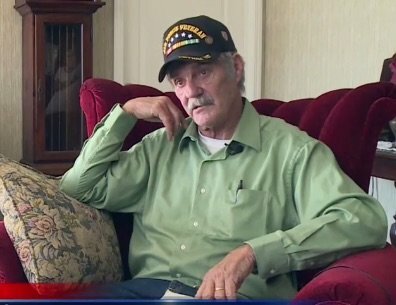 Verizon called him Oct. 21 before he returned and told him that he had a bill that included more than $3,300 in overages. His entire bill, which included other past charges, reached $4,148.09. His usual monthly bill is about $260. "I can't afford a bill like this,'' he said in the sheriff's report, which was filed Nov. 29. He said he feared that the bill would ruin his credit rating. In the report, Able said he contacted the company 10 times to determine how he could get hit with such a high bill. Able, a Vietnam veteran, also said he suffers from anxiety and post-traumatic stress disorder. Earlier this month, WRDW television station in Augusta, Georgia, reported the story. It said that a Verizon investigation into Able's usage "found the charges were valid.'' The company offered to cut more than $800 off Able's bill, bringing it to more than $2,400, after the station's story. He filed a complaint with the Federal Communications Commission this month. He said an official from the agency contacted him Wednesday and said the office is examining the complaint. The Verizon spokesman said the company sent Able dozens of texts, warning him of his data usage. Able said he rarely uses text messaging. "Despite the fact the charges on his account were valid, considering Mr. Able's circumstances, we felt that waiving the data charges completely and educating him about the tools to better manage his hotspot was the right thing to do,'' a Verizon spokesman said in a statement Thursday. While the amount for overages has disappeared, his feelings toward the company have not changed. Plain Dealer reporters Teresa Dixon Murray and Jo Ellen Corrigan contributed to this story.